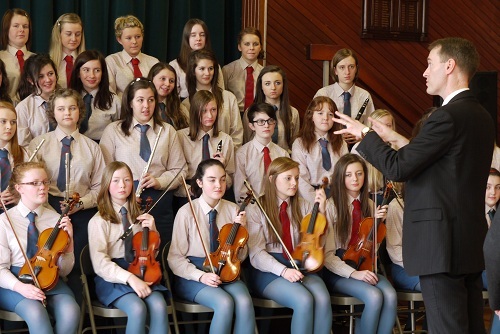 The Music Department emphasises the enjoyment of music-making and encourages students to pursue a wide range of musical activities. 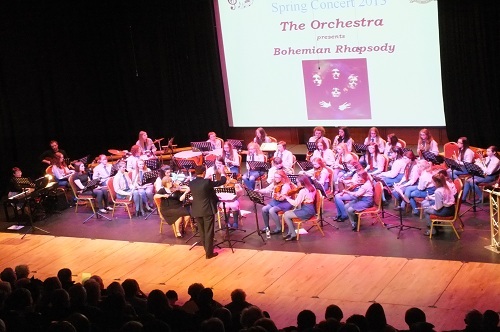 In Years 8, 9 and 10 the students engage in performing, composing and listening activities. Performing and composing work focuses on the recorder, percussion (tuned and untuned), keyboard skills and ukulele playing. Listening activities allow the students to study a wide range of musical genres. In Years 11 and 12 students may choose to study Music to GCSE level. This course continues the performing, composing and listening work of the Junior School. During the 2-year course, students study a variety of styles and periods of music with the final examination including performing two pieces (solo and ensemble, on an instrument of the student’s choice), submitting a folio of 2 compositions and a listening exam (including a number of Set Works). In the Sixth Form the Department offers Music at both AS and A2 Levels. The courses again test students’ Performing, Composing and Listening skills. For the AS performing exam, students are required to perform (minimum level of Grade 4) a programme lasting 5 – 7 minutes. For the composition exam students compose a piece lasting 1 ½ – 2 ½ minutes; this must be accompanied by a written commentary. In preparation for the written paper, students study a range of Sacred and Secular vocal music, and also Orchestral music from 1700 – 1900. For the A2 performing exam, students are required to perform (minimum level Grade 5) a programme lasting 8 – 10 minutes. For the composition exam students should compose a piece lasting 2 – 3 minutes; this must again be accompanied by a written commentary. In preparation for the written examination, students will study a range of Sacred and Secular vocal music and also Orchestral music from the Twentieth Century. 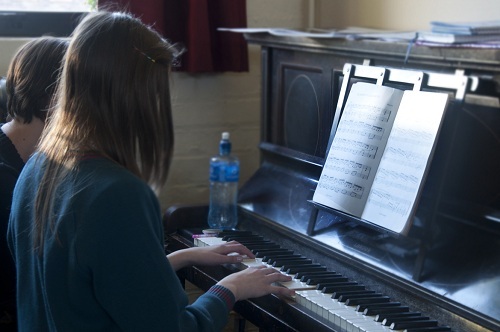 Some students choose to study Music in the Sixth Form as a basis for future study at University; others simply for the enjoyment of the subject and the opportunity to develop their musical skills to a high level. 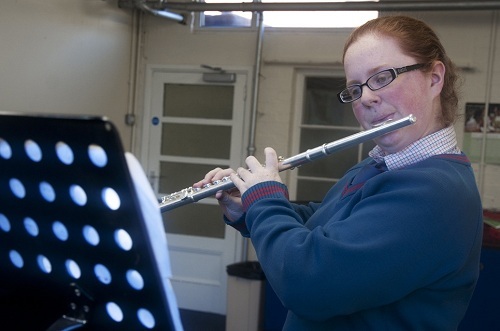 Extra-curricular musical activities flourish at Hunterhouse College. The Orchestra rehearses once a week and performs at concerts and Prize Events. Smaller groups and ensembles perform as the ‘band’ in school Musical productions and at our Carol Service and Spring Concerts. Students who enjoy singing are encouraged to join the Junior Choir (Years 8-10) and Senior Choir (Years 11-14). The choirs sing at the annual Carol Service, the Spring Concert, and other events and formal occasions (e.g. Prize Events) throughout the year. 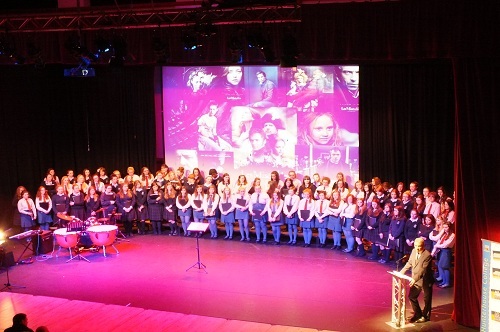 The Ulster Youth Choir give a workshop each year to the Senior Choir members. Students then have the opportunity to audition for the Ulster Youth Training Choir and the Ulster Youth Choir; each year students from the choir are successful in their auditions to one of these two outstanding choirs. Students are encouraged to join the ukulele club; this is now so successful that we have a beginner’s club and an advanced club. 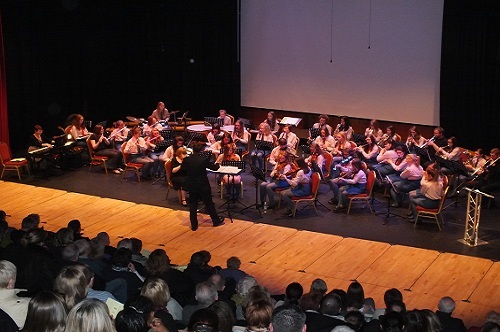 Regular trips are organised during the year to Ulster Orchestra concerts and other professional musical performances. Individual tuition is available in Flute, Clarinet, Oboe, Bassoon, Saxophone, Trumpet, Horn, Baritone, Trombone, Violin, Viola, Cello, Double Bass, Drum Kit, Guitar (acoustic and electric), Piano, harp and Singing. The school owns a number of orchestral instruments which may be borrowed by students taking instrumental lessons, subject to availability. There are two class teaching rooms, a music technology room with 15 iMacs and four practice rooms in the department.